Avocados are not just a tasty fruit that can add a little “umph” to your salad. These fruits, full of healthy fat, could help to even out insulin levels after your meal. Researchers from Loma Linda University in California recently conducted a trial to study the effects of adding a fresh Hass avocado into a meal at lunchtime. The researchers either replaced another food with the avocado, or they simply added avocado to the existing lunch menu. Including the avocado with the meal did not seem to alter the number of calories consumed. However, the addition of the avocado did have the effect of reducing hunger in the study participants. This helped to curb the desire to overeat in these volunteers who were already struggling with weight issues. Even more important was the ability of avocado to even out the rises in insulin that happen after a meal has been eaten. These rises are common in those with pre-diabetes. The process involves beta cells which continually make insulin and store it within cells. When you haven’t eaten in a while, your beta cells release a little insulin into your bloodstream. This allows your cells to utilize blood sugar even though you are in between meals. Once you actually eat a meal, your stored insulin is released immediately. When your blood sugar rises over 100 mg/dl, your beta cells will release more insulin into your bloodstream. In a healthy person, this “first phase insulin release” will keep blood sugar from rising really high because the insulin takes on the glucose that comes from the meal you have just digested. However, when a person is insulin resistant, it takes a lot more insulin to deal with the glucose from a meal. Eventually, your body can’t produce enough insulin to deal with glucose post-digestion and your blood sugar rises dramatically. The researchers would like to conduct more studies to determine avocado’s potential for improving blood insulin response. The research team would also like to learn more about avocado’s ability to trigger satiety. Taken together, these new avenues of research could provide further proof that avocado plays a role in both diabetes and weight management. Here’s another great health benefit of avocado: it could enhance your body’s ability to absorb health-boosting carotenoids. Researchers have discovered that when you add some avocado to a salad, for example, the tasty fruit can boost the absorption of two important carotenoids: beta carotene and lycopene.In fact, the addition of one cup of fresh avocado was estimated to increase the absorption of these two potent antioxidants by almost 300%! The researchers think this increased absorption is likely due to the fact that carotenoids are fat-soluble and avocado happens to be a rich source of healthy fats. Add some fresh avocado—or even avocado oil if you don’t like the texture of avocado fruit—to the next salad you eat and you will be considerably boosting the amount of antioxidants you absorb with your meal. 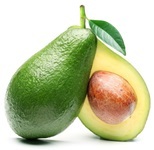 “Researchers explore the effects of avocado intake on satiety, glucose and insulin levels in healthy overweight adults.” Medical News Today, Sept. 21, 2013; http://www.medicalnewstoday.com/releases/266351.php, last accessed Sept. 24, 2013. Unlu, N.Z., et al., “Carotenoid Absorption from Salad and Salsa by Humans Is Enhanced by the Addition of Avocado or Avocado Oil,” J. Nutr., March 2005; 135: 431-436.